For unique corporate gift and business gift ideas, Contact us now to set up your appointment to speak with a Fretzels Corporate Gift Specialist. Make a sweet impression on your business associates with a Fretzels corporate gift assortment of hand-dipped gourmet chocolate-covered pretzels. Each corporate gift is beautifully packaged in our distinct classic Fretzels box for your most treasured employees and clients. Customize gifts for your clients and/or employees. 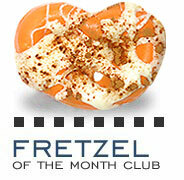 Fretzels can be customized for your company to match your logo and/or corporate colors. Fretzels by Jill are great for: marketing and promotional purposes, holidays, thank-you gifts, birthday gifts, congratulations, incentives & rewards, company banquets, employee and corporate anniversaries, administrative professionals day, conventions, trade shows, corporate theme parties, you name it! Please note: Minimum order may be required for customized corporate packaging, and we normally like to request a four week lead-time on custom orders. A longer lead-time may be required during the holiday period. Additional set-up fee for logos apply.